The ability to plan out, implement and measure the success of a strategic change is a key area that organisations need to improve at if they hope to stay afloat during the times of disruption that are on the horizon. The importance of strategic organisational change cannot be downplayed. After all, if an organisation is standing still not making any changes, then it is essentially going backwards. Crucial to the success of any change is guaranteed support from the senior management team, as this provides reassurance to those responsible for managing the change that this is the correct move for the wider business. 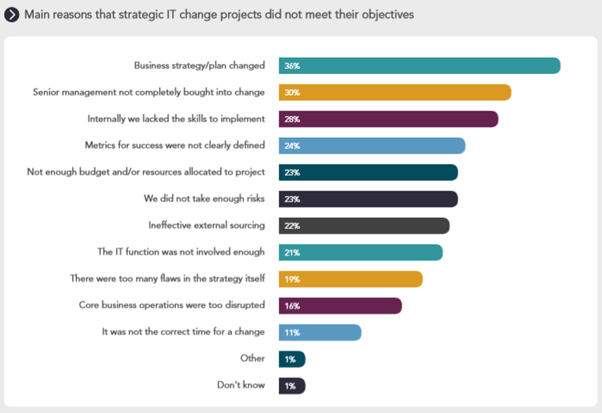 Staggeringly, only 6% of respondents in our 2019 CIO and IT Leadership Survey reported that over the last two years all of their organisation’s strategic IT change projects have met initial objectives, indicating that somewhere along the line something is going wrong. Leadership and the business-IT relationship has undoubtedly been an issue in recent times, with over seven in ten respondents (71%) citing at least one of: the business strategy/plan changing, senior management not being completely bought into the change, or not taking enough risks, as a reason for failure – see graph below. Companies lacking clear direction from the senior management team will struggle to hit their objectives and this is something that we feel must be addressed before any further actions are taken with regard to implementing strategic change. We firmly believe that large organisations need to get back to basics. Fewer than two in ten (18%) of the respondents that we surveyed told us that their company always sets objective success/ failure criteria for initiatives in advance. In our view this should form the foundations of any strategic change that is set to be implemented. This is especially pertinent when coupled with the fact that almost a quarter (24%) of respondents, from companies where at least some degree of failure has been experienced with strategic change projects over the last two years, report a reason for failure was that the metrics for success were not clearly defined. Without criteria for success and failure in place or knowing how you are going to measure the effectiveness of a strategy, then really there is no point in deploying the strategy at all. If you would like to discuss this blog, please get in touch at info@coeusconsulting.co.uk.